Hidden amongst these sunflowers is a tiny bird feeder. It is courtesy of sloppy birds that we get these bright flowers outside our bathroom windows. Happy summer day! Stay cool. 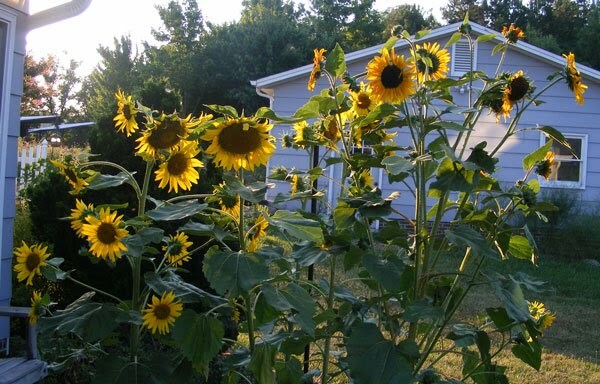 Beautiful sun flowers. I'm trying to talk my husband into planting these in the backyard! That is beautiful!! I LOVE sunflowers. I have some planted in my yard too. I am not sure the name of the ones I planted but the flowers are all the darker, red/orange tones. LOVE them but my fav is the bright yellow flowers. I will be getting those next year.